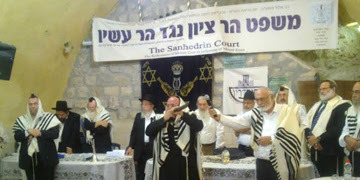 The other day I read, with much astonishment, an article at World Net Daily which shouted the headline, Sanhedrin Bans All Messianic Jewish Marriages in Israel. I knew that Orthodox Jews were unfriendly towards Messianic Jews, reviling them for their faith in Jesus Christ as the Messiah. And I knew that the court system in Israel was becoming increasingly hostile to Messianic Jews, but I wanted to understand why this latest assault against the Messianic faith was taking place. According to the article, Israel’s religious establishment is taking its persecution of Messianic Jewish believers in Jesus to a new level. "A rabbinic court, or Sanhedrin, has ruled that a Jew who believes in Jesus as the Jewish Messiah is no longer considered a Jew for purposes of marriage in Israel. This makes it impossible for two Messianic Jews to get married inside the country". First of all, this brings up thoughts of the Sanhedrin at the time of Jesus; and secondly, I wondered what purpose it serves this religious court to ban these marriages. The Israeli newspaper, Haaretz, reported the same understanding of the new ruling ... "Judges say the couple are not Jews but converts to Christianity, and must either renounce their new religion or marry as Christians". In other words, this couple would have to renounce Jesus Christ as their Savior and deny any faith in Him as the Son of God in order to have a state-recognized Jewish wedding ceremony in Israel. But Messianic Jews are Jews, and faith in Jesus does not change that, although it looks as if the modern-day Sanhedrin wants to change their legal status. 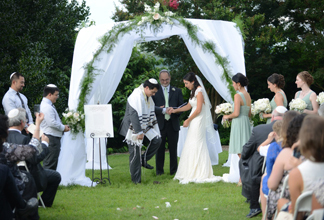 To deny a Jewish couple the rites and observances of a traditional Jewish wedding seems excessive and indefensible. According to the website Judaism 101, "A Jew is any person whose mother was a Jew or any person who has gone through the formal process of conversion to Judaism". Furthermore, according to the website, "A person born to non-Jewish parents who has not undergone the formal process of conversion but who believes everything that Orthodox Jews believe and observes every law and custom of Judaism is still a non-Jew, even in the eyes of the most liberal movements of Judaism. And a person born to a Jewish mother who is an atheist and never practices the Jewish religion is still a Jew, even in the eyes of the ultra-Orthodox. In this sense, Judaism is more like a nationality than like other religions, and being Jewish is like a citizenship". So, let me get this straight. You can be born to a Jewish mother and be an atheist, and still be a Jew. But if your mother is Jewish and you believe in Jesus Christ as the Son of God, then you are treated as if you are a non-Jew. But here's what I didn't know: ALL marriages in Israel are controlled by religious authorities, whether Jewish, Christian, Islamic, or any other faith. This is according to laws handed down under the Ottoman Empire, and retained by the British Mandate when Israel became a nation in 1948. But it gets even more interesting... according to halacha, which is the collective body of Jewish religious laws derived from the Written and Oral Torah, this Jewish couple would be seen as Jewish, because even Jews who convert to another religion can still be considered Jewish. So, why is this modern-day Sanhedrin so hell-bent on denying them a Jewish wedding, and denying them their rights as Jewish citizens of Israel? Dr. Michael Brown, a Messianic Jewish scholar and author, is quoted as saying, "In the eyes of most Orthodox Jews, Messianic Jews are heretics and idolaters, unworthy of being part of the larger Jewish community, even though they would consider us still Jews,” Brown told WND. “Many of them want to keep us out of Israel entirely, so refusing to grant two Messianic Jews an official rabbinic wedding is in keeping with their hostility toward us.” Dr. Brown goes on to point out that this ruling is in keeping with the persecution against Jews and believers in Jesus that the Bible tells us will come in the End Times. Then there is Messianic Rabbi Zev Porat, who is founder of the Tel Aviv-based Messiah of Israel Ministries. He grew up an Orthodox Jew, and his grandfather, Rabbi Pinchas Porat, was a Holocaust survivor who later became one of the heads of the Sanhedrin in Israel. Rabbi Porat laments this decision because it will deprive people of retirement, medical and other benefits that come with a state-recognized marriage. He said Israel’s Ultra-Orthodox Jewish leaders are celebrating this move because they have long been “furious” about Jews coming to Jesus Christ. Sound familiar? This is the same anti-Christ spirit that the Bible portrays among the members of the Sanhedrin that sought to kill Jesus. Before I go any further, I do not want this to be interpreted as hating or blaming the Jews for Jesus's crucifixion. On the contrary, I do not blame the Jews in Judah who were blinded by an anti-Christ spirit sent by Satan. Instead, I agree with Romans 11 which declares that God is not through with Israel, and that the fullness of Israel involves the full number of Jews being Saved by faith in Jesus as their Messiah, so that they will operate in full power and full character as God's Chosen People, and they will enter into their full purpose of leading the world to Christ. I celebrate the Jewish roots of my faith, embrace my Messianic brothers and sisters in Christ, and pray for the day that all Jews and Christians join together in praising Yeshua as the Son of G-d.
That being said, I also recognize that the Enemy has sought to keep many peoples of the earth, especially the orthodox among YHWH's chosen people, blinded to the truth of Jesus Christ. And now that same Anti-Christ spirit of old is attempting to destroy the identity of Messianic Jews by using the Sanhedrin to declare them no longer Jews, but Christians. Can you see how this would serve the purpose of Satan? If he can get the Israeli government to forbid Jewish believers in Jesus Christ to marry, and ultimately force them to leave the country, then Romans 11 will be more difficult to achieve. But I am here to tell you that there is an increasing number of Jews coming to faith in Jesus, and that is precisely why this orthodox rabbinic council in Tel Aviv is setting up roadblocks. But there is one more aspect of this situation that I found fascinating. Lion & Lamb Ministries points out that on October 13, 2004, the Sanhedrin Council of the Jewish nation was reconstituted for the first time in 1,600 years. The ceremony took place in the Israeli town of Tiberias, located on the western shore of the Sea of Galilee. This was the site of the council’s last meeting in the year 425 AD. This incredible development, largely ignored by the press, appears to be one more step toward the construction of a Jewish temple in Jerusalem. Since that time, there have been several attempts by Jewish religious leaders to ascend to the Temple Mount in Jerusalem where they hoped to pray and investigate clues pertaining to the location of the Second Temple, the one destroyed by the Romans in 70 A.D. Speculation has persisted that these attempts are all in preparation for the building of a Third Temple. 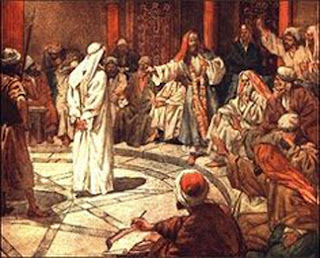 It is interesting to consider that while the Sadducees of the Bible are believed to have become extinct sometime after the destruction of the Second Temple in Jerusalem in 70 A.D., the Pharisees are believed to have changed and become the basis of Rabbinic Judaism today. Remember, the Pharisees in the Bible adhered to Jewish law and kept away from the Romans and secular authorities. They were the authorities that compiled the Mishnah and Gemorrah (the two parts of the Talmud) and thus they are the direct ancestors of Jewish law and practice today. So, it appears that the current Orthodox stream of Judaism in Israel and elsewhere, is a continuation of the Pharisees’ interpretation of Judaism. If the modern Sanhedrin has the building of a Third Temple in mind, then we know they are still awaiting the Messiah, and would resent the Messianic Jews who believe He has already come! But "resent" is probably too mild a word. This latest ruling that declares that the marriage ceremony of two Messianic Jews will not be recognized by the State amounts to nothing less than persecution. We are reminded of Jesus's words in Matthew 10: Beware of men [whose nature is to act in opposition to God], for they will hand you over to the courts and flog you in their synagogues; and you will be brought before governors and kings for My sake, as witnesses to them and to the Gentiles ... And you will be hated by everyone because of [your association with] My name. Note that these were His Jewish Disciples; and He is warning them that their fellow Jews would persecute them because of their faith in Him. All of this amounts to a spirit of fear [sent by God's Adversary] among the Jewish religious leaders, causing them to come against a sect of "Jesus-Believers" who are upsetting their power base and blaspheming G-d with their words and faith. Doesn't sound much different than what happened more than a couple centuries ago, does it? But this time, the outcome will be different, and I pray that the scales will be removed from the eyes of these religious men, and they will at last recognize their Messiah. It's been a long time coming, and I hope He doesn't tarry too much longer. John 1:12-13 "But to all who did receive Him, who believed in His name, He gave the right to become children of God, who were born, not of blood nor of the will of the flesh nor of the will of man, but of God". Great article! I was recently at a conference where Dr. Michael Brown was a speaker, along with some other prominent Messianic Jews. And I am leading a Bible Study of Romans, so this subject is something I was very interested to know, especially since I have this strange desire to live in Israel, though I am not aware of any Jewish bloodlines. Thanks for keeping me informed. I recently had the privilege of hearing Dr. Michael Brown speak at a conference near my home. It was great to hear he and the other speakers as they explained how important it is for Gentiles to bless Israel and also to pray and serve the Jewish people so that they become jealous and come to the Lord. I am so on the same page with you! I remember the first time I had my "Aha" moment after reading Romans 11... Why hadn't I seen this before? From that moment on, I have honored the roots of my faith and prayed for the people of Israel to call on the Name of the Lord. And I am not too sure that all of us might not have some DNA associated with the 10 Tribes of Israel that were taken into captivity by Assyria, and then exiled to what is now Europe and the British Isles. But yes, we should all be praying for the unblinding of the Jews. 2 Peter 3:4,11-12, 8-9 and in that order. 4 They will say, “Where is this ‘coming’ he promised? Ever since our ancestors died, everything goes on as it has since the beginning of creation.” You ought to live holy and godly lives 12 as you look forward to the day of God and speed its coming. 8 But do not forget this one thing, dear friends: With the Lord a day is like a thousand years, and a thousand years are like a day. 9 The Lord is not slow in keeping his promise, as some understand slowness. Instead he is patient with you, not wanting anyone to perish, but everyone to come to repentance. I would warn anyone who force Yeshua back before He is ready, for to do so only puts your salvation at risk! Has everyone came to the Lord? No, in fact, by your unholy agendas, your setting back this time line. When it come to, Judging other, I remind you of Matthew 5:2-16, 7:1-5, Colossians 4:5-6. We are to love all and let God do his job, and in the end you will end up among the sheep and not the goats at the resurrection of the dead.